One of the biggest philosophical dilemmas facing libraries today is: how do we make our heritage collections accessible to the public while also protecting them for future generations? Auckland War Memorial Museum at their local library. This problem is also faced by museums, art galleries and myriad other public institutions, and historically the answer has been to err on the side of keeping our taonga under lock and key, rather than placing them in the hands of the people. However, this could all be changing with the implementation of the collaboration between Auckland Libraries and Auckland War Memorial Museum (AWMM). 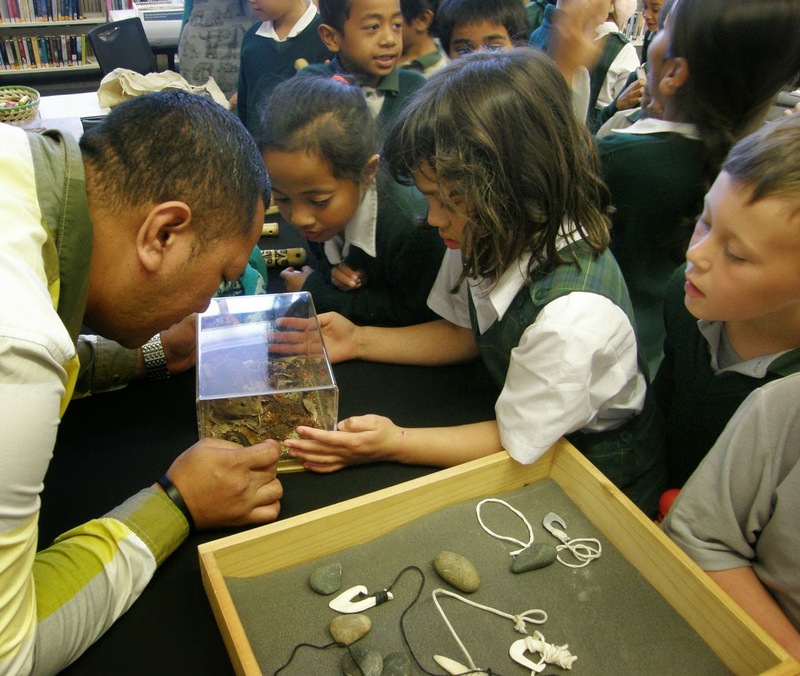 As part of Pacific Language Weeks 2013, Auckland Libraries piloted a programme in partnership with the AWMM that saw staff from the museum bringing historic artefacts to libraries to deliver interactive storytimes and workshops on Māori and Pacific arts. “Focus area 4: Priority- Work in partnership with Pacific people to develop programmes that are culturally relevant” - Te Kauroa. After evaluation of the 2013 programme, it was decided to extend the workshops and make them available to all 55 library branches throughout the year. Every library in Auckland was given the opportunity to participate and a toolkit of resources was made available to librarians who were interested in partnering with museum staff to deliver a workshop. For 2014, as well as profiling the taonga and resources available at AWMM, the programmes have been designed to raise awareness within local communities of the diversity of Auckland, and provide access to and for Māori and Pacific communities. The programme is delivered specifically to ECE-Intermediate age group and each session is localised for the community and adapted to fit the cultural backgrounds of the students. “Libraries should use targeted programmes and flexible service options to increase the relevance of libraries to all the diverse communities of Auckland.” - Te Kauroa. Libraries Adviser Pacific Service Development Liz Muliaga (along with colleagues Anne Dickson, Youth Services Development Advisor, and Anahera Sandler, Pou Whakahaere Māori Advisor) has coordinated this year’s partnership with AWMM and is excited about the way the workshops have been received so far, but is also looking ahead to how this programme can be developed further. However, challenges remain in terms of connecting library collections with the workshops, rather than simply providing a venue for their delivery. “Focus area 5: Work with Pacific communities to ensure their stories are collected and preserved for posterity.” - Te Kauroa. There is a wealth of Māori and Pacific items in the Auckland Libraries Heritage and Research collection, much of it considered taonga or measina, with historic value. And not only does the collaboration with AWMM offer amazing opportunities for connecting Aucklanders with their heritage, it also offers a chance for librarians to become more familiar with what's on offer. Many have worked tirelessly to ensure that these collections are accessible and engaged with by Pacific Auckland and greater Auckland. Liz says: “We are building on this and looking at innovative ways to build the accessibility of our collections - the collaboration with AWMM is just one of those ways." In Papakura, Sir Edmund Hillary Library signed up for a workshop called “If this whenua could talk” presented by museum staff Karena, Alicia and Juanita. This group presented a story-based workshop that used props to create an awa. The story was interactive, with call-and-answer language learning, and the presenters also used modern slang and place names to bring the ancient Māori story to life. Participants were divided into patupaiarehe from the Waitakere Ranges and turehu from the Hunua Ranges. Each group was taught how to use patu and a patia. Each side prepared for a great battle by following two of the presenters and learning the calls and movements with their weapons. After the story was done, the children engaged in an activity, the magic matau, creating their own fish hook pendants for necklaces.